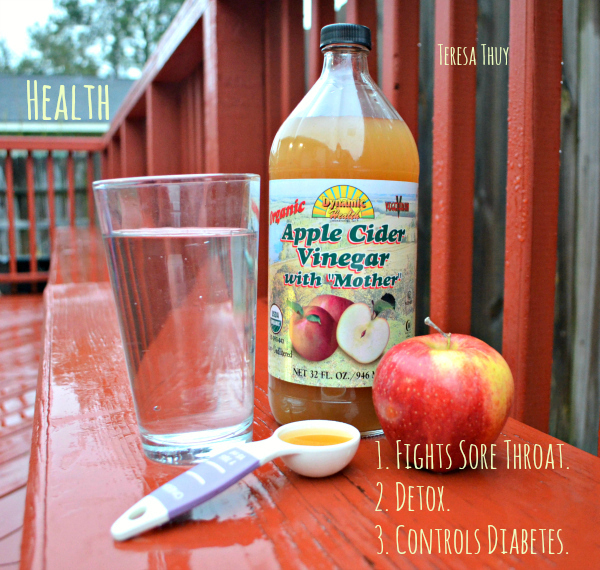 For centuries, apple cider vinegar has been used for its many health and beauty benefits. Since learning of these, I wanted to add it to my daily regimen! Vinegar is found in almost every kitchen cabinet and is used in cooking to improve the flavors of food. Since it can kill bacteria, it is an effective and safe household cleaner that doesn't contain toxic chemicals like most cleaning agents do. Here's how: You must read how my friend, Vanessa, uses a little vinegar and water to clean her whole, entire home. You can breathe easy knowing it isn't harming you, nor burning your throat, eyes, and nose in the process! So, what is apple cider vinegar? It has the same benefits of vinegar, but since it is made from organic apples, it can do a whole lot more. It is made by exposing the liquid of organic crushed apples to yeast, which ferments the sugar and turns it into alcohol, or delicious hard apple cider. In the second fermentation process, the alcohol is converted to ---- apple cider vinegar! 1. Health - Apple cider vinegar (ACV) has antibiotic properties. If you have a sore throat, you can drink an 8 oz. glass of water with a tablespoon of ACV added. This will kill the bacteria lingering in your throat and stop that cold dead in its tracks. BAM! Daddy knows best! He drinks 1-2 tablespoons in his water daily. 2. Beauty - Want glowing, even skin? Using apple cider vinegar as a toner will help you achieve that. First, it helps to balance the pH of the skin. ACV also kills acne bacteria, so it prevents breakouts on my oily, once acne-prone skin. Lastly, it contains alpha hydroxy acids, which even out the skin tone and brighten the skin. To reap all of the benefits of apple cider vinegar for the skin, dilute equal parts of ACV with water. Apply with a cotton round onto cleansed face in the morning and evening. 3. Food - I love to make my own salad dressings. For a bit of zing, I squeeze a quarter of a lemon or add apple cider vinegar with a drizzle of a tablespoon of olive oil onto my salad. Add a dash of pepper, lump of hummus, and your favorite veggies. No preservatives required! I recommend getting apple cider vinegar that is made from organic apples, since non-organic apples are usually sprayed with pesticides. Also, make sure it is raw and unpasteurized, since this contains the "mother". The "mother" has the enzymes, pectin, trace minerals, and benefits that I love from ACV! You can find Dynamic Organic Apple Cider Vinegar with "Mother" on Amazon. I have used and found Bragg's Organic Apple Cider Vinegar at my local health food store.